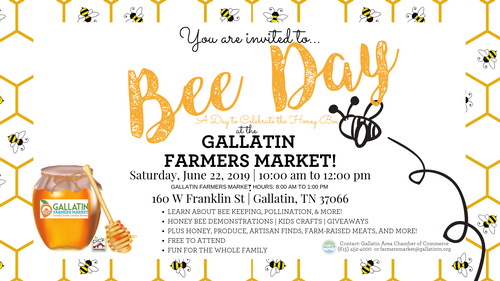 Join us as we learn more about the Honey Bee at Bee Day at the Gallatin Farmers Market, a celebration of the Honey Bee, on Saturday, June 22, 2019, from 10:00am until 12:00pm. Learn about beekeeping, pollination, honey production, and more. The Gallatin Farmers Market will be open from 8:00am to 1:00pm with honey, produce, plants, artisan finds, local farm-raised meats, baked goods, and more! For information about the Gallatin Farmers Market, call the Gallatin Area Chamber of Commerce at 615-452-4000 or email farmersmarket@gallatintn.org.